Panel members included John F. Haught, PhD; Ilia Delio OSF, PhD; John Grim, PhD; and Kathleen Duffy, SSJ, PhD. 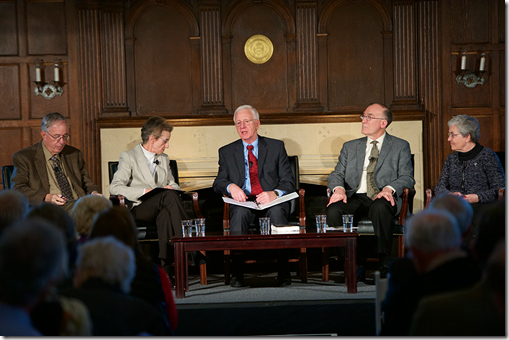 The discussion was moderated by Frank Frost, PhD, director of the Teilhard de Chardin Project. I received an e-mail from The Teilhard Project that the video is now available on the Georgetown University website. To access the video, click here. It is a fantastic discussion and worth viewing. This entry was posted in Hymn of the Universe, Mass on the World and tagged Georgetown, Georgetown University, Pierre Teilhard de Chardin, teilhard, teilhard de chardin, The Teilhard de Chardin Project, The Teilhard Project. Bookmark the permalink. Greg, many thanks for your post! It is good to finally be able to link to the video, and we are getting lots of enthusiastic feedback. Hope you have the occasion to come to Washington again some time soon and that we have the chance to get together. Just thought I’d check your website and I’m thrilled that you are posting again! Thanks for this. Loved that bot mot by Dr. Delio, “The unreflective cyber-life is not worth living.” True, he implicitly predicted cyber-life. Yet, cyber-life needs Teilhard! September 1st is the 100th anniversary of Teilhard’s Croix de Guerre. This calls for a celebration.